Scientists agree that during subduction, the edge of one tectonic plate sinks beneath another, moving surface carbon in the form of carbonates into Earth’s mantle, which accounts for more than 80% of Earth’s volume and represents a giant carbon reservoir. But whether those carbonates sink all the way through the mantle to the core-mantle boundary, or completely melt and break apart somewhere higher up, is still a controversial question. Answering this question would impact our understanding of what materials make up the mantle, and how much carbon it holds. A new study published in the journal Earth and Planetary Science Letters  finds that carbonates (CO3) may reach the deep lower mantle in the form of high-pressure marble rich in calcium carbonate. DCO Extreme Physics and Chemistry Community members Susannah Dorfman (Ecole Polytechnique Federale de Lausanne, Switzerland, now at Michigan State University, USA), James Badro (Institut de Physique du Globe de Paris (IPGP), France and Ecole Polytechnique Federale de Lausanne, Switzerland), and colleagues simulated the transport of carbon to the lower mantle by combining dolomite, a sedimentary mineral composed of calcium magnesium carbonate (CaMg(CO3)2), with iron under high pressure and temperature. The researchers discovered that while the magnesium carbonate part of the mineral broke down to yield diamonds and other compounds, the calcium carbonate portion remained stable. The study suggests that slabs of subducted surface material may reach the core-mantle boundary bearing diamonds and marble. To begin answering this question, the researchers simulated what would happen to a subducting slab as it reached the lower mantle. Dorfman and colleagues used a diamond anvil cell, which compresses a small sample between two diamonds to generate tremendous pressure, and heated the apparatus with a laser. Inside, two slices of dolomite, which makes up an important carbon reservoir in subducting slabs, sandwiched a layer of iron foil, which represents iron in the deep mantle and at the core-mantle boundary. The researchers heated the sandwich to between 1,500 and 2,200 degrees Celsius and 51 to 113 GPa pressure, which is between 0.5-1 million times the pressure at sea level and corresponds to most of the range of pressures that occur in the lower mantle. Dorfman points out that it’s also possible that the calcium carbonate component will react with silicate minerals in the mantle, if they are nearby, which other DCO researchers have demonstrated previously. If this occurs, then all the carbonate in the slab would likely end up as diamond instead. The amount of oxygen in the subsurface, which can be measured as oxygen fugacity, will also impact whether carbonates survive into the deep lower mantle. Scientists generally think that oxygen levels in the mantle decrease with depth. “Oxygen fugacity is a way of putting a number on the amount of oxygen, just like pH is a way of putting a number on the acidity of a system,” said Dorfman. In the current study, the iron foil in the sandwich keeps the oxygen fugacity in the reaction low, to better simulate the deep lower mantle. The results suggest that calcium carbonate is less sensitive to oxygen fugacity than magnesium carbonate. In the mantle, as oxygen disappears, magnesium carbonate will become diamond first, while calcium carbonate converts to diamond only at lower oxygen levels. Dorfman recently received a National Science Foundation CAREER grant to continue working on the question of whether carbonates reach the core-mantle boundary. She and her colleagues plan to complicate their system by adding silicate minerals to better simulate the mantle environment that surrounds a subducting slab. They also plan to investigate further how different oxygen fugacities affect the survival of carbonates in the mantle. These findings may help explain fluctuations in atmospheric oxygen over time, and how Earth maintains the current balance of oxygen that makes the planet habitable. 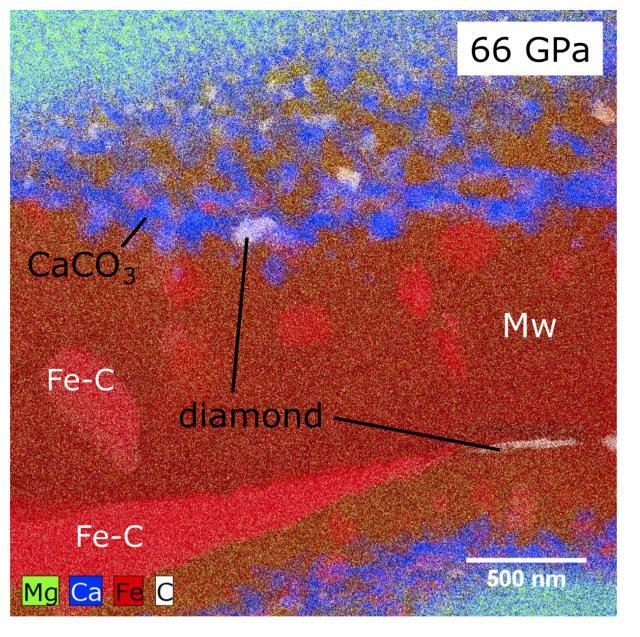 This energy-dispersive X-ray map shows the results of the reaction inside the dolomite-iron sandwich cooked at 66 GPa and 2000 °C. The elements are color coded as follows: red = iron, blue = calcium, green = magnesium, white = carbon. Mw represents magnesiowüstite ((Mg,Fe)O). Credit: Dorfman, et al.